Pin Money: Just an ordinary girl... in an ordinary world? Just an ordinary girl... in an ordinary world? It's 2012! Here's to a fresh start on the small and the big things that we want to accomplish and there's no time like the present. I was recently at a conference, and one of the speakers at the conference reminded me of this quote that I think is perfect for this New Year. Helen Keller was once asked, "what is worse than being blind?" and she said, "Having sight with no vision." Every year all of us are at fault of saying we are going to do things, but do we really see ourselves doing them and make them happen? Make this year different and never look back. Promise yourself that you will not be that ordinary girl in an ordinary world.. stick to your own word, it means something. Below are some inexpensive, strong, statement pieces that will only add to your "I can do it" mentality. Follow through with your own word, see yourself doing it, and make it happen. Cheers to a fabulous 2012! 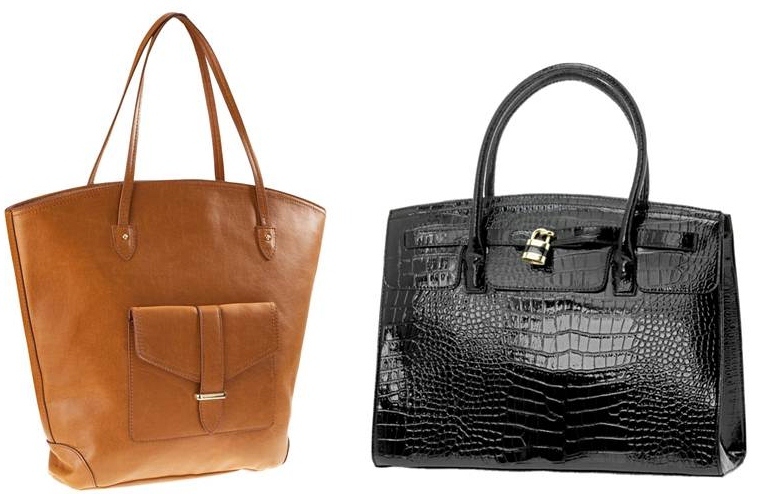 A rich looking bag makes a statement, plain and simple. Regardless of what you have on a chic bag can really pull an entire look all together and it doesn't have to be expensive. Carmel or black colored purses are timeless. Find this beautiful caramel colored bag at H&M for $39.95 or find this textured midnight black Stellfox bag at Aldo for $55.00. A rich looking bag will make you look and feel like a powerhouse...especially since it holds all of your essential items! A statement watch looks rich, powerful, and professional. Get yourself a couple... especially at these fabulous prices. 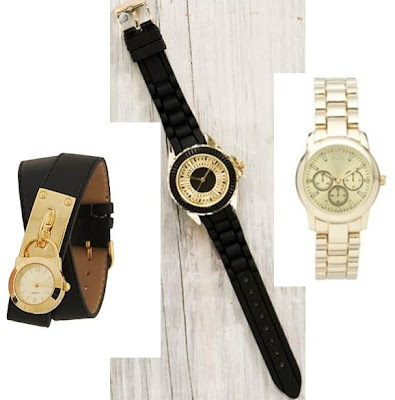 Find this leatherette wrap watch at Forever 21 for $15.80, Time of day watch in black at Francesca's Collections for $18.00, and this gold tone boyfriend watch at Target for $14.99. 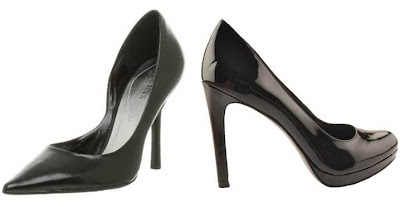 A good pair of black pumps are a must. They work with anything in your wardrobe, plus you just feel fantastic in a good pair of heels. Find this Guess Carrie pointed pump for $69.00 at Dillard's or these rounded toe BCBGeneration pump at Dillard's for $59.99. Wear color!! You will be noticed and you will feel beautiful! Here are some random colorful pieces that will kick off your colorful wardrobe. 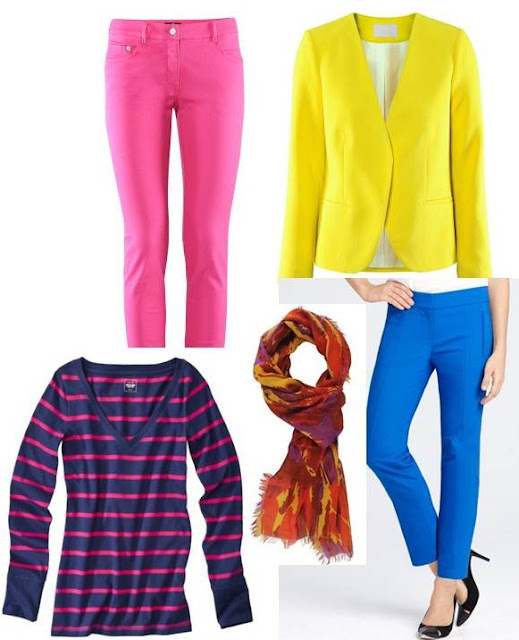 Find these Ann Taylor bright blue ankle pants for $88.00, Target long sleeve pink and blue tee for $12.00, Yellow H&M Blazer for $59.95, H&M pink jeans for $24.95, and vibrant Forever 21 scarf for $8.80. 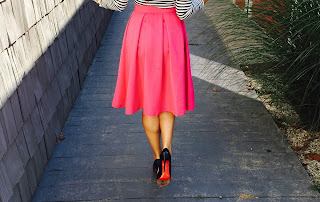 Pair your colorful items with jeans, skirts, pants, anything! Happy 2012!! Here's to a great year of looking and feeling fabulous! Mixology... three color combos to try now!